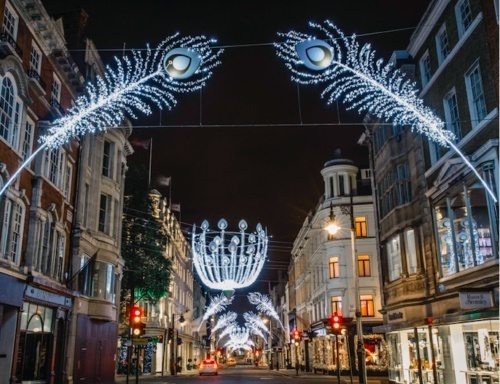 London is an amazing city to be in at Christmastime with an array of sparkling light displays, fun activities, shows and festive shopping centres decked out with trees and decorations. Hopefully, it will snow in time for the big day but it doesn't always. The winter I was living in London didn't see snow until January but these days there is plenty of fake snow around at certain events for you to pretend you're not dreaming of a white Christmas but experiencing one. Hogwarts in the Snow is one such event that sees Warner Bros Studio Tour – The Making of Harry Potter – transformed into a magic winter wonderland, complete with blankets of snow, dripping icicles and an orchestra of instruments at the Yule Ball; glorious garlands, glistening trees, flaming puddings and turkeys in the Great Hall; and special-effect fires roaring in fireplaces, plus so much more. 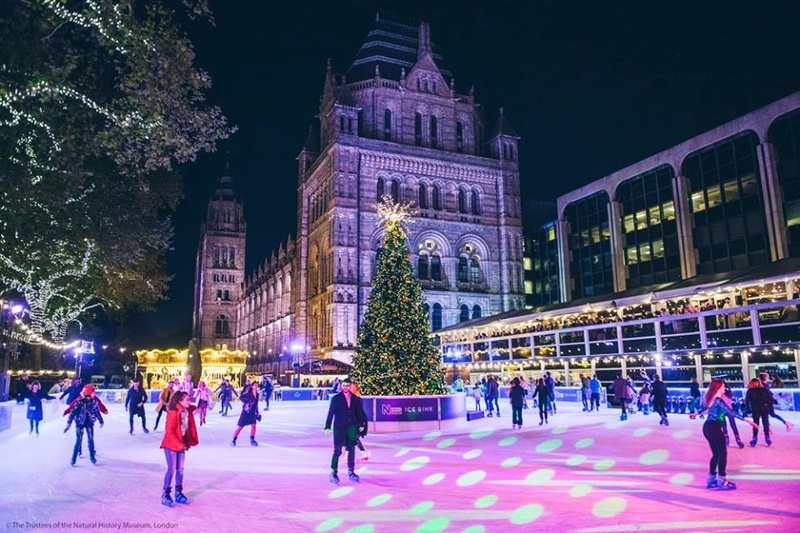 More icy fun can be had at the Natural History Museum Ice Rink where you can skate outdoors beneath thousands of twinkling lights. With the museum in the backdrop and its alpine-style cafe with winter warming beverages overlooking the rink, a towering Christmas tree and a host of free acoustic performances, it's the perfect place for the whole family. For shopping and lights, you're spoilt for choice. The Spirit of Christmas in Regent Street has the largest installation in the city with glittering angels suspended as if they're floating in the sky watching over you, whilst the Oxford Street Christmas Lights see some new purple baubles hanging amongst over 1,100 other decorations covering the famous street. Be sure to check out Selfridges and their rocking Santas in a wild in-store celebration. 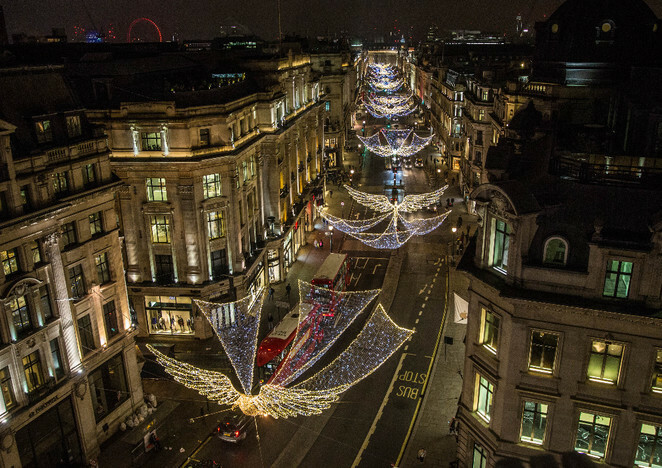 On Bond Street, peacock-themed lights illuminate the sky and festive treats abound. Shop window displays in all of these boutique areas are sights to behold as well. 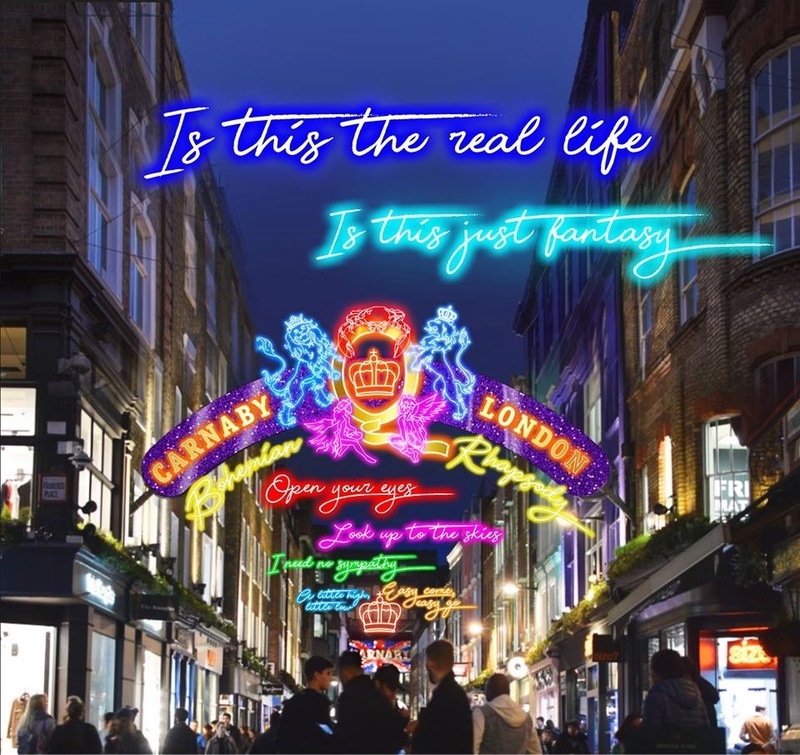 Carnaby Christmas Lights nearby will set the skies of the area's 14 streets aglow with a carnival-inspired theme that sees a Queen-inspired installation with a crown emblem and the lyrics of Freddie Mercury's Bohemian Rhapsody displayed in bright lights, in addition to neon coconut trees and flamingos, giant party poppers, tropical flowers, feathery parrots, colourful toucans and a pair of parakeets (signifying the release of a pair by legend Jimi Hendrix back in the 60's). 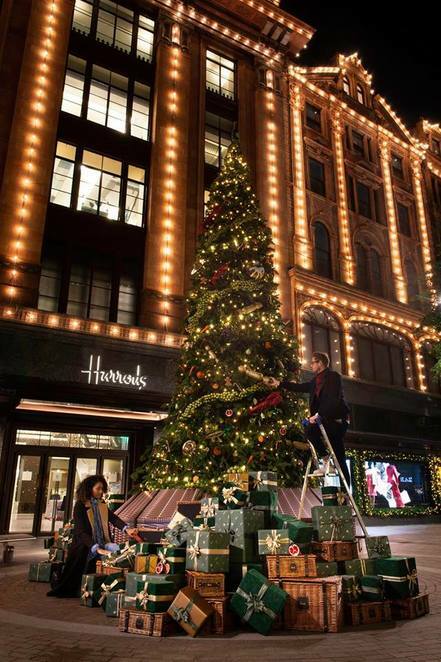 Let's not forget the luxury of Harrods either. 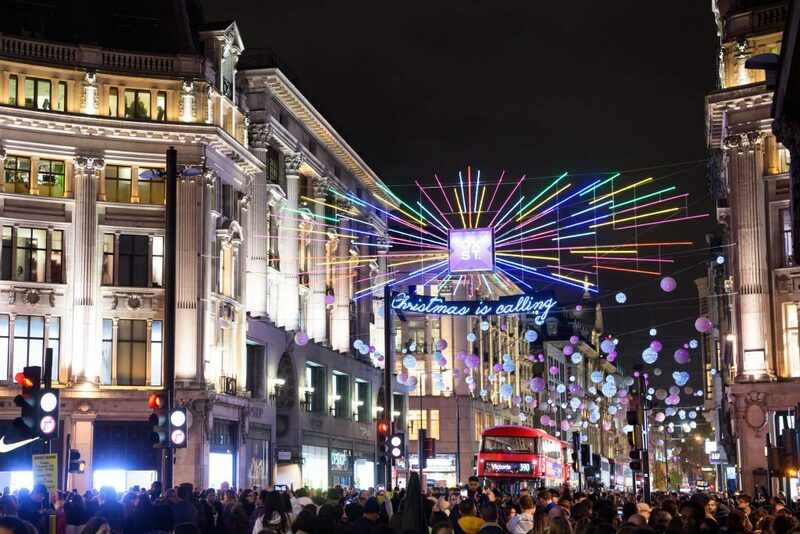 Well, it's a treasure any time of the year and at Christmas it continues to astonish with lights, its giant Christmas shop, retail theatre, product quality and first class service. With a massive 330 departments on 7 floors, including the new Superbrands department of women's wear with 27 boutiques, shoppers can also dine in 27 restaurants and enjoy afternoon tea at the elegant Georgian or relax at the Urban Retreat spa. Over at Covent Garden, amble around the cobbled streets perusing the Apple Market for crafts and gifts and take in designer brands Chanel and Mulberry that call 'the garden' home. For children, a number of toy shops abound that include the Disney Store, Benjamin Pollock's Toy Shop and the Moomin Shop. At the same time, marvel in a winter wonderland of 100,000 shining lights, mistletoe chandeliers dripping in glistening berries, glitter balls, a magnificent reindeer statue and a huge Christmas tree in the 19th-century Piazza. There's also a Christmas Treasure Hunt, a Christmas Cart with a selection of Christmas treats and a green vintage '67 Morris Minor decked out in festoon lights, Christmas presents and festive green wreath for you to snap a unique Christmas photo. If you're looking to catch a festive show, then head to Christmas in Leicester Square and their velvet-draped 1920's spiegeltent. Catch drag-meets-circus troupe Brief's new show Close Encounters or The Showstoppers' Christmas Kids Show, to name but a couple. Explore a traditional market too with stalls filled with handcrafted gifts and warming winter food and say hello to Santa. 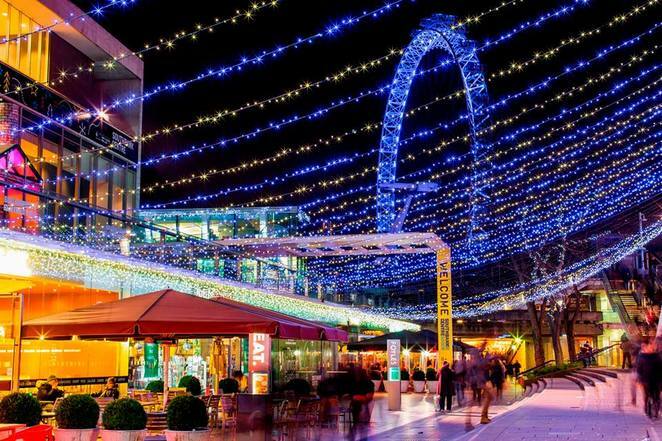 Other festive shows and entertainment can be found at the Southbank Centre Winter Festival beside the Thames. They have a packed program of free and ticketed events, including Circus 1903 and Rumpelstiltskin. 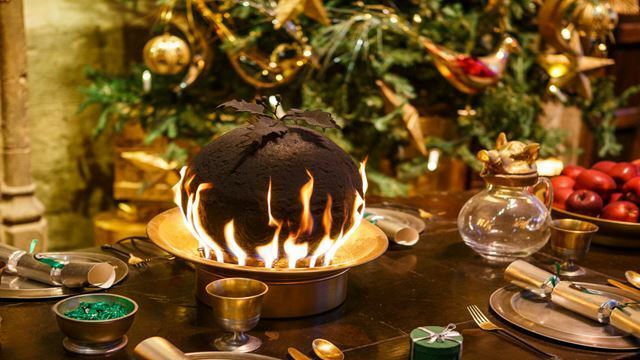 Additionally, there's comedy and cabaret nights, a Christmas concert, a traditional choir performance, a Christmas market, workshops, craft, cheese-themed food at Bar Under the Bridge and igloos at Jimmy's Lodge serving seasonal drinks and warming dishes. The Royal Albert Hall Christmas Festival is also the scene for music, carols, dance and song. The seasonal joy includes a mix of jazz classics and soulful Christmas songs with Guy Barker's Big Band Christmas, comedy stars celebrating 30 years of 'Whose Line is it Anyway? ', a gospel Christmas concert, a performance of Handel's Messiah by the Royal Philharmonic Orchestra and more. 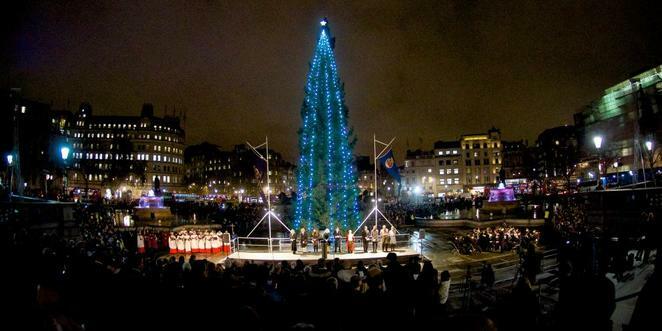 At Trafalgar Square, a Norwegian Christmas tree (selected from forests surrounding Oslo) stands tall and sparkly with hundreds of light bulbs set in vertical strings of light (Norwegian fashion). Gifted to London each year from the people of Norway as a thank you to Britain for their support in World War II, it is a historic tradition dating back to 1947 that sees carol singing groups gather beneath it to entertain visitors with festive favourites, from Deck the Halls to Ding Dong Merrily on High. 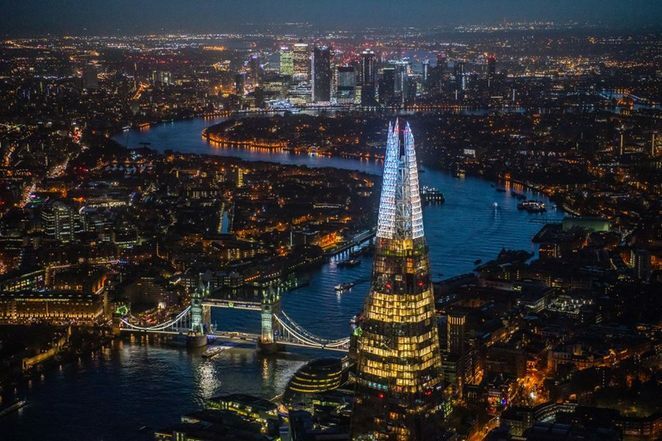 Down at London Bridge City, you'll find a magical riverside retreat in Christmas by the River with a traditional Christmas market set against views of the majestic Tower Bridge and the Tower of London. Wooden cabins shimmer with seasonal fare, food and drink tastings entice the crowd, as do presents, stocking fillers and free art & craft workshops. Shard Lights brighten the night across the capital in a repeating Christmas show on the top 20 floors of The Shard skyscraper. Reflecting the changing colours of the sky, it's a celebration of golden sunrises through to pink and lavender-tinted sunsets. 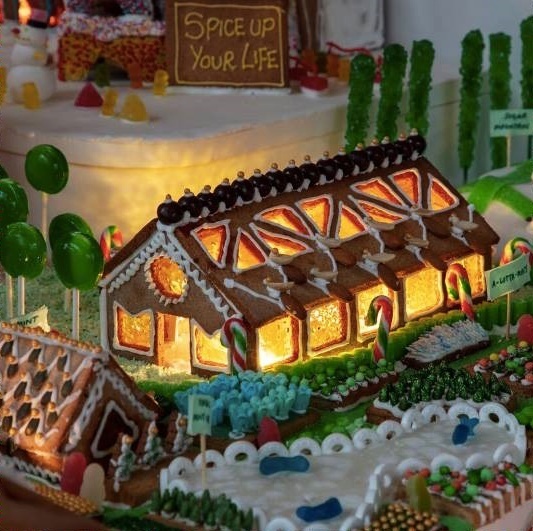 At the Victoria and Albert Museum, a Gingerbread City has popped up thanks to some keen architects, engineers and designers. The exhibition consists of over 60 gingerbread buildings, all beautifully decorated, and aims to be a playful way to encourage conversation around the future of our built environment. 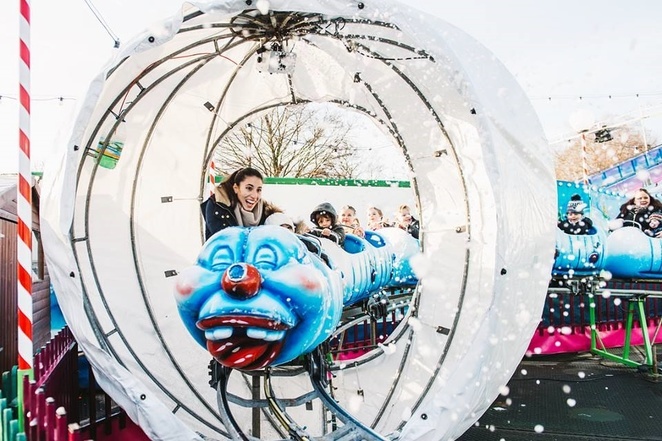 For thrills galore, head to the massive Winter Wonderland in Hyde Park. It's got everything, from carnival rides to multiple Christmas markets, ice skating and acrobatic circus wonders. You can discover mythical creatures in the Magical Ice Kingdom's Secret Forest, immerse yourself in a cinematic adventure with The Snowman Experience, create your own sculpture at an Ice Sculpting workshop, enjoy a Teletubbies Christmas Show and step into Santa Land to see the man in the red suit. On the morning of Christmas Day, the Peter Pan Cup is on for you to watch brave swimmers compete for gold in this annual race on the icy waters of The Serpentine lake. Another huge event is Winterville at Clapham Common with attractions including an ice rink, spiegeltent, Plonk golf, a roller disco, Solo craft fair, Chivaree Circus, fairground rides, an adults-only puppet show housed on an old London bus, a street feast and Backyard Cinema's Christmas Labyrinth where you navigate a magical maze full of surprises to discover an enchanted forest with 2 cinema screens featuring festive flicks, a bar with live entertainment, singing statues, hidden rooms and a whole lot more fun. At Southwark Park, stumble into the fairytale world of Alice in Winterland with 160 giant magical lanterns telling the story of both Alice in Wonderland and Alice Through the Looking Glass. Thousands of lights and 29 immersive scenes bring a festive atmosphere. 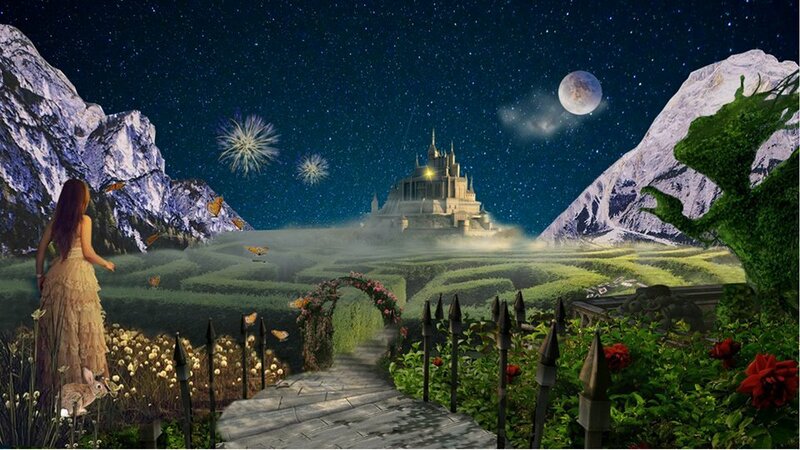 Wander the illuminated Flower Garden, meet some of Lewis Carroll's characters (including Alice, the Queen of Hearts, Pudding Man and Cheshire Cat) and play giant chess with a friend. Get your photo with Santa in his grotto, have a bite to eat of some seasonal fare at the Mad Hatter-inspired tea party dining area and enjoy the carols by local choirs on the stage. It's a must-see for fans of the tales. London Zoo in Regent's Park also has a fairyland-style light show with glittering decorations, illuminated animal sculptures, light tunnels, singing trees, and glowing fountains at the historic Lubetkin penguin pool that dance in time to the sounds of Christmas classics. Pause at the Mappin Terraces as Magic Mountain springs to life with colour and playful projections. 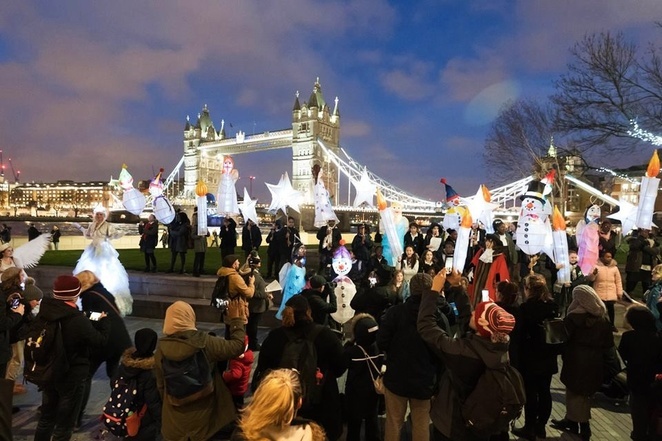 Look out for hidden surprises with the likes of frosty snowflakes, wooden sledges, gigantic baubles and shimmering stars where you least expect them. 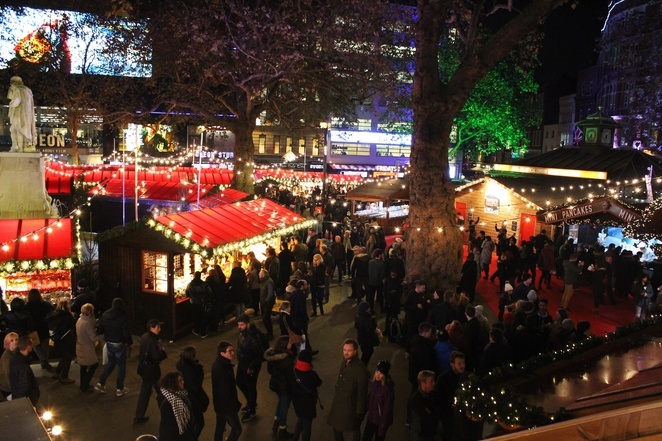 See Santa too and head to the Christmas village for some festive food and a hot chocolate under the stars. 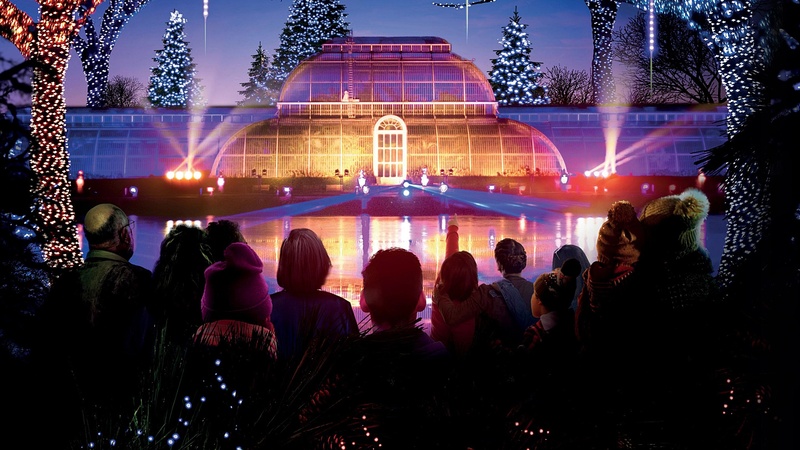 More spectacular festivities can be found at Richmond with Christmas at Kew Gardens, where a mile-long trail takes you on an enchanting journey through a field of light, a sculptured fire garden, a laser garden in moonlit woods and a lake shimmering with twinkling origami boats. 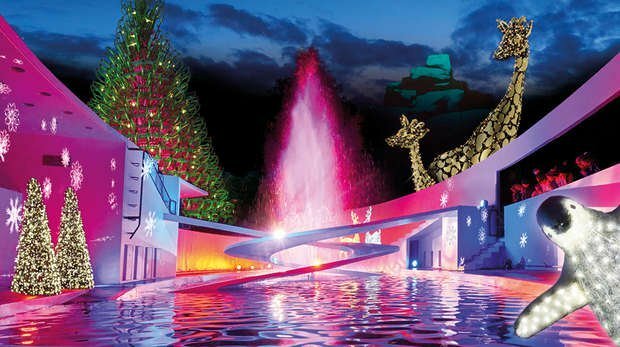 Giant flower sculptures, jumping jets of light and water, Santa and his Elves, vintage rides and Christmas treats are just some of what you will find. Oh London, whether you snow or not, you're a wonderful city to be in at Christmastime where, around many a corner, you glitter from the ground to high above in dazzling form. With each event providing something unique, you won't want to leave.